As members of the Adult Vaccine Access Coalition (AVAC), we value the opportunity to comment on the Centers for Medicare and Medicaid Services: Innovation Center New Direction Request for Information (RFI), one that promotes patient-centered care and tests reforms that empower Medicare beneficiaries, brings greater transparency and competition to drive quality, reduce costs and improve outcomes. AVAC includes more than fifty organizational leaders in health and public health who are committed to addressing barriers to adult immunization and to raising awareness of and engaging in advocacy on the importance of adult immunization. Our mission is informed by scientific and empirical evidence that shows immunization improves health, protect lives against a variety of debilitating and potentially deadly conditions, and save costs to the healthcare system and to society as a whole. AVAC priorities and objectives are driven by a consensus process with the goal of enabling stakeholders to have a voice in the effort to improve access to and utilization of adult immunizations. Our coalition advocates for policies that will reduce barriers to immunization and for common sense measures that will improve the ability of providers and patients to make informed decisions at the point of care. Immunizations are a proven intervention that is effective at preserving health and reducing avoidable health care costs such as hospitalizations and other expensive medical interventions that result from vaccine preventable illness1. Over 20 years, vaccines will prevent 732,000 deaths and 21 million hospitalizations. 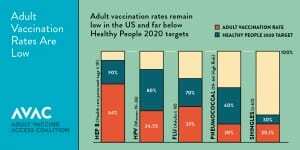 Despite Advisory Committee on Immunization Practices (ACIP) recommendations, which include 13 different vaccines for adults, vaccines have been consistently underutilized in the adult population and lag behind the Healthy People 2020 goals for the most commonly recommended vaccines (influenza, pneumococcal, Tdap (tetanus, diphtheria, pertussis), hepatitis B, herpes zoster, HPV). Every year, more than 50,000 adults die from vaccine preventable diseases and thousands more suffer serious health problems that cause them to miss work and leave them unable to care for those who depend on them.3 A growing body of research illustrates the direct and indirect cost attributable to vaccine preventable disease. One study published in The Journal of Primary Prevention found the estimated annual cost of just four major vaccine-preventable diseases among US adults was $26.5 billion annually, $15 billion of which was attributed to those 65 years and older. While immunizations are essential to protecting health across the lifespan, it is especially important to immunize older adults, who are at increased risk for vaccine-preventable conditions as a result of waning immunity and increased likelihood of co-morbid, chronic conditions, and who are more likely to develop complications. Adults seeking access to and coverage for vaccines encounter a confusing health care system that presents multiple barriers, including lack of awareness and information about recommended vaccines, financial hurdles, including high cost sharing, as well as technological and logistical obstacles. Socioeconomic and linguistic barriers further challenge the ability of diverse and medically underserved communities from accessing needed immunizations. Recognizing the challenges, barriers, and opportunities around adult vaccination, the National Vaccine Program Office within the Department of Health and Human Services issued the National Adult Immunization Plan (NAIP) in 2016.5 The NAIP and its accompanying implementation guide set out four core goals along with a series of objectives and strategies what steps the range of federal and nonfederal stakeholders need to undertake to help drive adult immunization rates. 1. Choice and competition in the market – Promote competition based on quality, outcomes, and costs. 2. Provider Choice and Incentives – Focus voluntary models that reduce burdensome requirements and unnecessary regulations, allow physicians and other providers to focus on providing high-quality healthcare to their patients, and give beneficiaries and healthcare providers the tools and information they need to make decisions that work best for them. 3. Patient-centered care – Empower beneficiaries, their families, and caregivers to take ownership of their health and ensure that they have the flexibility and information to make choices as they seek care. 4. Benefit design and price transparency – Use data-driven insights to ensure cost-effective care that also leads to improvements in beneficiary outcomes. 5. Transparent model design and evaluation – Draw on partnerships and collaborations with public stakeholders and harness ideas from a broad range of organizations and individuals across the country. 6. Small Scale Testing– Test smaller models that may be scaled if they meet the requirements for expansion under 1115 A(c) of the ACA. Focus on payment interventions rather than on specific devices or equipment. AVAC proposes four pilot project models for CMMI consideration. 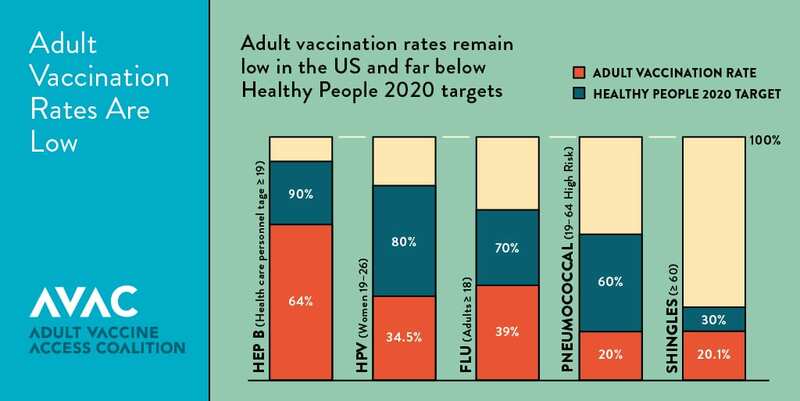 These models focus on barriers to adult immunization for the Medicare population and present an important opportunity to test data driven approaches to improving access and utilization of recommended adult vaccines. Specifically, the models touch upon provider challenges to offering the broad range of vaccinations in the office setting as well as financial barriers for Medicare beneficiaries seeking access to vaccines through the Part D benefit. While each represents a different approach and intervention, all share the goal of strengthening and enhancing access and utilization of adult immunizations that serve to protect health and prevent or mitigate serious illness. Additionally, each model seeks to improve transparency, beneficiary choice and competition in the market through patient centered initiatives that will ultimately improve care and drive down health care costs over the longer term. Test the integration and utilization of billing systems that enable providers in the clinical setting to review a patient’s Part D vaccine coverage and to directly bill Part D plans for the cost and administration of covered vaccines . Study the impact on vaccination rates and potential savings to the Medicare program through the reduction in avoidable downstream healthcare costs. This pilot could fall under the prescription drug model focus area described in the RFI. Whereas Medicare Part B covers vaccines for several serious vaccine-preventable diseases, including influenza, pneumonia, and Hepatitis B for at-risk patients with zero cost sharing; a growing number of other vaccines are covered under the Medicare Part D program. Should a provider wish to offer and administer Part D covered vaccines to beneficiaries, they encounter a difficult and time consuming process since they do not have access to the same systems that pharmacies utilize to process claims for Part D covered prescriptions.6 First, it can be challenging for Part B providers to assess a beneficiary’s Part D eligibility, coverage and cost sharing requirements. Providers who choose to offer Part D vaccines in their office must also find a mechanism by which to submit claims for vaccine services. This can include billing the patient for the total upfront cost of the vaccine; enrolling in a commercially available out-of-network billing system for Part D vaccine claims (such as TransactRX); or obtaining an out-of-network authorization for coverage from the Part D plan, then submitting the out-of-network claim on the patient’s behalf and agreeing to accept the Part D payment on a patient-by-patient basis. For physicians who choose to stock vaccines in their offices, these options are not only complex but also create a great deal of financial uncertainty around reimbursement. As a result, many providers opt to not offer Part D vaccines, resulting in missed immunization opportunities during office visits. The current billing system severely hinders opportunities to fully immunize Medicare beneficiaries in a medical setting and hampers efforts to improve immunization rates for the 65 and over population. The study would determine the effectiveness of billing mechanisms that enable Part B Medicare providers to assess beneficiary Part D coverage as well as bill Part D plans directly for vaccines administered in their office. The main objectives of this study would be to reduce administrative burdens on providers by improving their ability to search Part D plan eligibility and coverage data and to facilitate electronic claims submission for vaccines and their administration Additional element of this study would include data reporting to state or local immunization information systems (IIS) in order to measure changes in immunization rates among the study group as well as a review of overall health claims to determine downstream savings to the Medicare program. Explore the impact of strengthening and enhancing the role of immunization assessment and counseling at the IPPE and the AWV on Medicare beneficiary immunization coverage rates. The objectives of this pilot would be to improve patient care and enhance reporting of administered vaccinations with goal of bolstering immunization rates for beneficiaries while reducing downstream health expenditures for the Medicare program. This pilot could be incorporated as an element of the Comprehensive Primary Care Plus project or the Transforming Clinical Practice Initiative under the Primary Care Transformation category presently ongoing at CMMI. The IPPE, or “Welcome to Medicare” visit, along with the AWV, represent important opportunities to assess the overall health status of a new Medicare beneficiary entering the program as well as monitor and assess their health on an ongoing basis. Since 2011, the number of Medicare beneficiaries utilizing the AWV has grown steadily from 8 percent in 2011 to 19 percent in 2015.7 While an assessment of immunization status is a core element of the IPPE, confusion around which vaccines covered through Medicare Part B and Medicare Part D can result in a weak or perhaps no provider recommendation to receive certain vaccines. The pilot would explore the impact of the HHS National Vaccine Advisory Committee (NVAC) Standards for Adult Immunization Practice for ACIP recommended vaccines on provider interactions with Medicare beneficiaries during the IPPE and the AWV. The adult standards call for providers to assess the immunization status of the patient; strongly recommend needed vaccines based on the age and health status of the beneficiary; administer or refer the patient to a vaccine provider and document to the state or local immunization registry. Consistent application of these standards during the IPPE and AWV would improve the efficiency and effectiveness of these interactions between providers and Medicare beneficiaries, resulting in a reduced number of missed immunization opportunities, improved immunization coverage rates, patient health outcomes and lower downstream costs to Medicare program. Analyze the impact of offering Part D vaccines with no cost sharing to beneficiaries in Medicare Advantage plans. A growing number of Medicare beneficiaries are enrolling in Medicare Advantage plans options. Today, one in three Medicare beneficiaries, a total of 19 million people, is enrolled in a Medicare Advantage plan. Since MA plans include both the medical and pharmacy spending, they can be leveraged to assess how vaccination uptake impacts downstream medical spending within one plan. Primary goals of this study would be to examine the impact of cost sharing upon vaccination rates and explore reductions in avoidable hospitalizations and other healthcare costs. This pilot would fall under the Medicare Advantage (MA) Innovation Models testing area focus of the RFI. A number of studies indicate that financial barriers to Part D vaccines are a significant impediment to beneficiary access to some immunization services. The vaccines covered through Part B do not have any beneficiary cost sharing requirements. In comparison, cost sharing is allowed for vaccines covered under the Part D program. A 2015 report by the Alliance for Aging Research on vaccination rates among older adults found that cost sharing for vaccines under Part D varies depending on a beneficiary’s prescription drug plan or Medicare Advantage plan formulary offerings.9 Similarly, a report by Avalere Health found between 47 and 72 percent of the 24 million Medicare beneficiaries with Part D coverage had some level of cost sharing for vaccines, ranging from $35 to $70 in 2015. Similar to the above pilot, CMS could evaluate vaccine utilization rates in a stand-alone Part D plan where beneficiaries have zero-dollar cost sharing for all ACIP-recommended vaccines not covered under Part B. The project could also assess varying tiers of cost sharing (i.e. no cost vaccine tier compared to a range of cost sharing regimens) to better identify the cost threshold for vaccine uptake. In addition, this model would improve competition and price transparency for vaccine coverage under Part D plans. This pilot could be a prescription drug model focus area for CMMI. A study in the August 2016 Journal of American Pharmacy Benefits found a correlation between increases in cost sharing and increased vaccine abandonment at the pharmacy. During the study period, a total of 172,977 fills for Zostavax were initiated, and a total of 67,369 were abandoned for an overall abandonment rate was 38.9%. While the abandonment rate varied by patient demographics and health plan factors, patient out-of-pocket cost (OOP) remained the most significant predictor of abandonment, after adjusting for other factors. For patients with $15-$34 copays, the odds of abandonment were 1.66 percent compared to those with costs of $14.99 and below. Patients with cost sharing ranging from $105-$174.99 were 5.53 times more likely to abandon the vaccine. The variable cost sharing requirements currently imposed on the majority of Part D vaccines discourage immunization among elderly, disabled and chronically ill populations who account for a disproportionate percentage of the morbidity and mortality from vaccine preventable conditions. Removing this financial barrier could have a significant impact on improving beneficiary access to and utilization of vaccines and will also help drive reductions in hospitalizations and avoidable medical expenditures in other parts of the Medicare program. Addressing this barrier will be even more important as new vaccines for a growing variety of infectious and devastating conditions enter the market in the future. Immunization has demonstrated “effective prevention” in reducing rates of morbidity and mortality from a growing number of preventable conditions and has been proven to improve overall health in a cost-efficient manner. Reducing the number of missed immunization opportunities for Medicare beneficiaries is an important step to improving health and reducing the burden of vaccine-preventable illness among this rapidly growing segment of our population. Thank you for this opportunity to offer our perspective on this important topic. We look forward to working with CMMI moving forward to increase access and utilization of adult vaccines. Please contact Lisa Foster, AVAC Coalition Manager at (202) 540-1070 or info@adultvaccinesnow.org to schedule a chance to further discuss our comments in response to this RFI. To learn more about the work of AVAC, visit www.adultvaccinesnow.org.